While traditional hunting knives are known for their strength and attractive design, they can often fall short in terms of everyday use. Many of these heavy folders have to be opened with two hands and they lack a pocket clip. 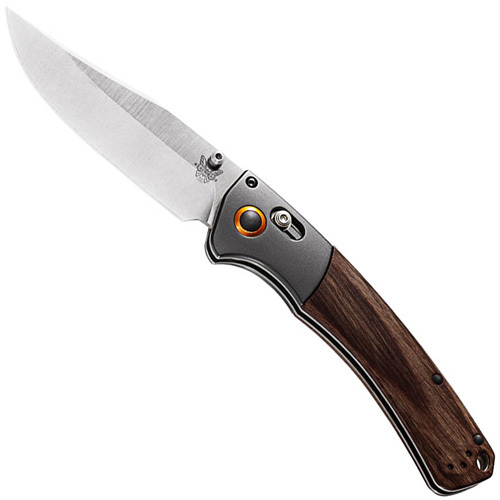 With the Benchmade HUNT Crooked River Knife, Benchmade takes the classic hunting knife design and updates it with modern technologies. The slim clip point blade deploys easily with ambidextrous thumb studs, and locks into place securely with the AXIS lock mechanism. The durable Dymondwood handle is lightweight and easy to grip, making it a breeze to control the CPM-S30V steel blade. A reversible, tip-up pocket clip is included. Measures 236 mm (9.3 inches) in overall length.